George the Car Guy: Volt or Milllivolt? The turmoil surrounding the Corvair allowed VW to make immense headway into the North American market over the next few years bringing with it the concepts of economy and quality. The VW Beetle also let the press compare the U.S. product against it which further ‘proved’ that American products were inferior to imports. When the Japanese vehicles reached North American shores in the late 60's / early 70's the consumer mind set was positive toward them because they were economical and had good quality compared to American products. At the time, they were great - no rattles, good paint, etc. - because of their construction methods and because there were few models, no options other than colour, choice of transmission and radio. No power this or that. Turns out that the Japanese cars were biodegradable and, for the most part, not suited well to long distance driving. They were, however, cheap and easy to repair by almost anyone. People didn’t care because they were told that these cars were better than their American counterpart. So, to get into the mix, GM created the Vega and Ford the Pinto. The Vega had potential, but its engine was too ‘out there’ with its fancy Silicone/Aluminum block that was not repairable. The Pinto also sold well until a couple caught fire in rear end crashes. Then the bottom dropped out of that market too. The novelist Tom Clancey turned the scenario around in his book “Debt of Honor” with the import catching fire and the media railing against it. The rest of the story demonstrates the ultimate power of the press’s ability to influence public opinion. So, back to the Chevrolet Volt. Is the battery unsafe? Maybe. But a fuel system can be compromised in a crash and lead to an issue later while in storage. Is it an ‘Obamamobile? Only because he used it as an example of American resilience after the market meltdown a couple of years back while visiting a GM assembly plant. Yet it’s become a political football because of tax funded rebates to ‘green car’ purchasers. Never mind that other hybrids qualify for some form of rebate or concession. Can the Volt come back? The Corvair, Vega and Pinto didn’t. Neither did American cars with diesels. Maybe the Volt can buck the trend. Audi did after its ‘phantom acceleration in Park’ twenty years ago. Toyota did after its recent ‘floor mat on the gas pedal but it has to be the car’ issue. But don’t bet on it. An American car never has. I doubt the press would allow it. It would mean that they were wrong. Now that it has become a political football it's hard to say how well it will do. I know the people that own one love them. I also think that you have to really understand what type of Hybrid is going to best fill your needs as they are all a bit different. I think Hybrids in general are going to be a relatively short term solution to a long term problem. We can still improve on the internal combustion engine weather it's gas or diesel. True enough on all counts. Still, of all the hybrids, the Volt is, in my opinion, the best choice for the short distance commuter. 100% electric until the juice runs out and then the engine takes it the rest of the way. Apparently the Volt only caught fire after a severe side impact test and after sitting for weeks. Also the battery was not discharged as per GM "after crash" instructions. 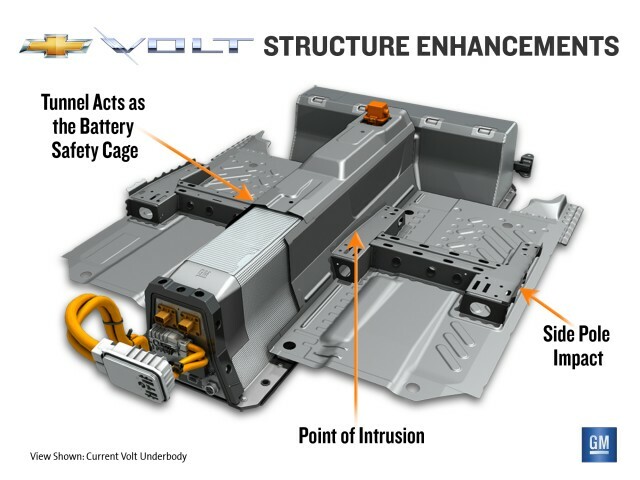 The NHTSA passed the volt as being safe car. Compare that to the 5,020 car fires per year reported in and around gas stations between 2004 and 2008, according to the National Fire Protection Association.